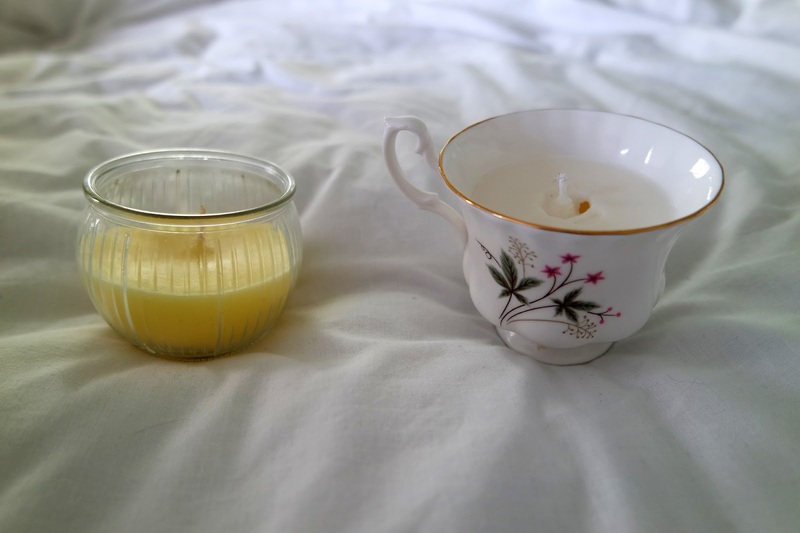 Today I have a different kind of post for you, something that will involve you getting creative... candle making! I've never done this before and I'm pretty chuffed with the results, as I poured the melted wax into the jar I didn't think it was going to ever set (after about 10 minutes, how impatient am I) not realising you're supposed to leave it to cool overnight whoops! (I did don't worry haha). Also, I went to the next level and even make a yellow candle... go me. 001: Fill your jar with wax flakes - it should be tightly packed, then double this amount. 002: Put the wax in a pan and gently melt over a low heat until the flakes have dissolved - stir to encourage any lumps to break up. Turn the heat off and allow to cool for a minute. 003: Add your essential oils (I went for a coconut and mango scent) then use funnel to pour the wax into your jar. 004: Allow the wax to cool and turn slightly opaque before putting in the wick. Once the wax is cloudy and thick but not set, push the wick to the bottom and it should stand by itself. Leave candle to harden overnight and trim the wick! Have you made any candles before?